Mammoth Supply Company, a Fonterra brand, promoted coffee and chocolate flavoured iced milk in Australia with “Brick Footy”, an advertising campaign targeting NRL supporters during the finals season in September. 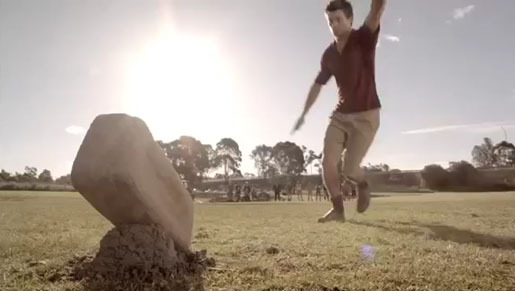 A television commercial shows a group of men playing rugby league with a solid brick instead of a football. The campaign also includes radio, outdoor, PR, digital, point of sale advertising, along with an extensive sampling program. The Brick campaign was developed at CumminsRoss, Melbourne, by copywriter Sean Cummins, art director Jason Ross, agency producer Susannah George, and account manager Amanda Kramer. Filming was shot by director Bruce Hunt via Revolver Film with producer Pip Smart. Editor was Drew Thompson at Guillotine. Online editor was Justin Bromley at Fin Design with colourist Trish Cahill. Sound was designed by Dylan Stephens at Risk Sound. Ambient, digital and Facebook aspects of the campaign were developed at The Marketing Zoo. Media was handled by OMD.